So often I hear people say that they don't know how to help or they don't have the time to do a big fundraiser. They say the small amount they have to give wouldn't make a difference, so why bother. Well, this is where I usually get on my soapbox and start talking about how one person can make a difference and that you don't need to give thousands of dollars to help save endangered wildlife or the habitats they live in. My family is by no means wealthy. In fact, for many years we lived paycheck to paycheck - just barely getting by. However, I always managed to do something to make a difference, even if it was only recycling the cans and water bottles we used. It was better than them ending up in a landfill right? As I learned to stick to a budget, I was able to give more monetarily. Still not a lot, but something. It felt good to give and know that I was making a difference and helping to save an endangered animal. I taught these values to my son and as you may know, he has become quite the little philanthropist. Making a difference in the world can be fun too - Just get creative! Dylan currently has three different San Diego Zoo Global fundraisers going on and I was getting very confused with what money went where, so we grabbed some jars (re-purposed from our kitchen), some mailing labels and our Sharpie pens. Not only do the jars make it easier to keep the money separated, but they make us smile and look pretty darn cool on the counter! Cans for Critters is a recycling fundraiser that will help Dylan meet his conservation requirement for Cub Scouts. All the money he gets from recycling gets put in this jar for the critters. Animal Care Wish List is a monthly list of wishes from the keepers at the San Diego Zoo and San Diego Zoo Safari Park for the animals. Sometimes it's feeding the animals, buying special toys for animal enrichment, or helping the conservation projects around the world. 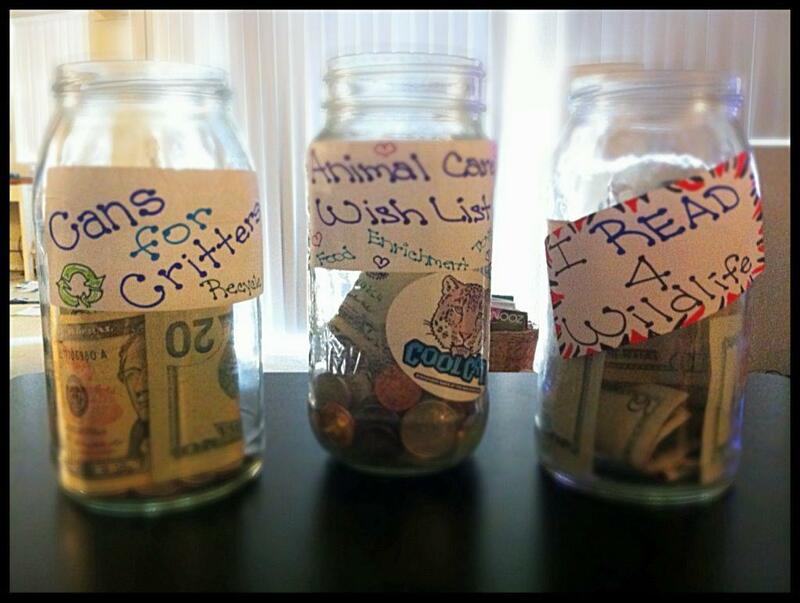 This jar collects all of our spare change and pays for monthly items on the wish list. I Read for Wildlife is the latest and greatest fundraiser where Dylan has promised to read 1500 pages of fascinating animal facts in 100 days. Money from his sponsors or that he has raised gets put in this jar. Now that you see how easy (and fun) it can be to help endangered species, what will you do to make a difference? Will you start a fundraising jar? Remember, there is no time limit and no rule that says you need to raise thousands of dollars. Find something that you are passionate about and start saving your spare change. Coins add up quickly and many items on the Animal Care Wish List cost less than $10. EVERYONE can make a difference - YOU just need to pick a day to start - Why not TODAY?